WOW! following the rather dismal grey & wet affair that was April, May began with clear blue skies and high temperatures quickly rising to 27 degs celsius. 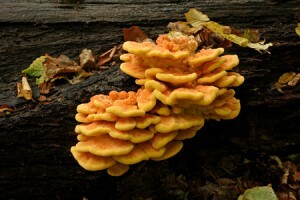 This had an immediate effect on the fruiting pattern of one of our most stunning polypore’s, Laetiporus sulphureus, commonly known as ‘Chicken of the woods’. Following the fairly persistent rain toward the end of April, even though temperatures at that point barely got above 15 degs, this fungus began to fruit sporadically on the older Oaks on Hampstead Heath. As the temperatures began to rise, this species seemed to explode from practically every other tree on the Heath, including Willow, Cherry and False Acacia (Robinia). I don’t think I can recall a mass fruiting like it before, the closest would of been back in 1996, when there was a fairly large amount of fruiting but nothing on this scale. Wonderful and along with the earlier, healthy fruitings of St George’s mushrooms, which began on March 28th in these parts, it has been a good start to 2008, lets hope it continues…. What started as a promising season for 2008 actually ended as being a rather mediocre one. In the main I would say the year was a little up on 2007. The problem again came with too much rain over the summer and autumn months. 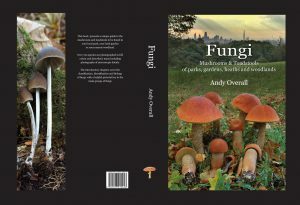 Thankfully (some of you may disagree) it was a bit warmer than 2007 in general and this was reflected in the diversity of fungi recorded. 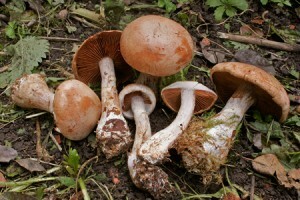 Once again it wasn’t such a great year for the Boletes, as they prefer the hot summers followed by rain in the autumn. Of the mycorrhizal fungi Other genera faired quite well, Russula and Amanita did quite well, whilst Lactarius seemed to struggle a bit, at least at the sites that I visit each year. Puttenham Common in Surrey had a good season for Cortinarius especially the abundance of C. bivelus but there were also good populations of various Russula as well as some good Boletus, though these appeared earlier in the season, August & September being the prime months here. 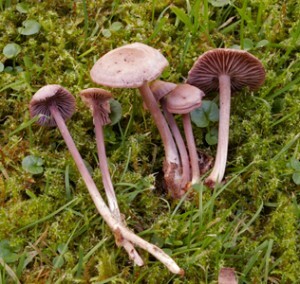 Hampstead Heath and Epping Forest both had fairly good seasons with some good records but a lack of healthy populations, the Hampstead highlight for me would be Mycena diosma a lilac, small to medium species close to Mycena pura but with a distinct smell not unlike incense, especially when kept in a container. This is only the third time I have seen this species. Epping Forest held no great surprises but again Otidea cochleata, O. alutacea and O. onitica are all worthy of mention for their scarcity. Wimbledon Common was very ordinary compared to previous seasons but still had a surprise or two such as Cortinarius croceus, whilst the New Forest was I would say slightly up on last year with good populations of most genera apart from Boletes, highlighted species here would be Aurantiporus alborufescens a red data listed species from the Polyporacae family, for which the New Forest is currently a stronghold. During 2008 I also completed the first ever commissioned survey of Richmond Park on behalf of the Royal Parks. This was very interesting and revealed some very rare species, not least the endangered and law protected Piptoporus quercinus . The survey ran from April to December 2008 and took in 24 visits, 290 species were confirmed from over 1000 records made. 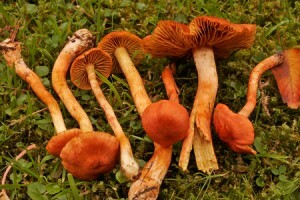 Of particular note were species associated with dead wood, such as Spongipellis delectans , Coriolopsis gallica , Schizophyllum amplum and Gloeoporus dicrous . All rare species of varying degrees. Also of note were three different species of Otidea ‘Hares’s Ears’, a good population of Amanita ceciliae and the alien deceiver Laccaria fraterna which turned up on the penultimate visit to the park in December. This particular species associates with Eucalyptus and these were close by to the one and only Eucalyptus in the Pembroke Lodge gardens, that of E. amygdalina.